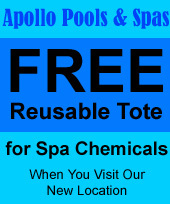 Apollo Pools and Spas is a full-service swimming pool, spa, and hot tub retailer. Keep your water in pristine condition with pool supplies, maintenance and repair services from Apollo Pools & Spas. We offer everything you need to keep your pools and spas at their best. choice for you by contacting us in Portland, Oregon, today. In addition to services for swimming pools and spas, we offer sales, installation, and service for Presidential Billiards™ pool tables. This ensures that you have great entertainment even on those rainy days that keep you indoors. Contact us to order your perfect pool table today. Apollo Pools & Spas is a professional pool maintenance company that's been serving Portland, Oregon, for more than 45 years. We offer affordable pool supplies, sanitation systems and equipment sales along with superior installation and services that keep our customers pools and spas in top working order. The team at Apollo Pools & Spas has more than 80 years of combined experience and is able to provide the guidance you need to choose the products for your pool, spa, or hot tub. Plus, we give you access to some of the highest quality pool tables in the area.